As I type this, I have my fingers crossed my computer will last one more day. Well, actually, just a few more hours. My new laptop is on a UPS truck somewhere nearby, and I can't wait to get it and set it up. What does this have to do with Weekend Cooking? I decided to give myself a break this week and tell you about an exciting opportunity I have to work with Abrams Books over the next year. 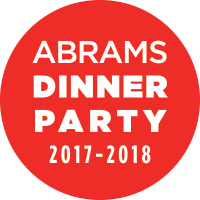 I've been invited to the Abrams Dinner Party! I'm thrilled to have the chance to share their entire food and drink catalogue for an entire year. I won't necessarily be posting a detailed review of every book, but each one will be featured here, on Twitter, on Instagram, on Facebook, and/or on Litsy. I have permission to share scans of photographs and recipes from the books, and I'm looking forward to a year of learning and discovery. So how does this affect my opinions and reviews? Don't worry, I'm not getting paid, and I fully intend to provide you with my honest opinion of any book I review, whether here or on Litsy. Because of FTC rules, whenever I write about an Abrams Dinner Party book or post a photo on any social media, I am required (by law) to disclose my association with Abrams. I've decided to use the suggested hashtag #ad because it's small and unobtrusive. The first book this year is Acid Trip: Travels in the World of Vinegar by Michael Harlan Turkell. This is a beautiful book with matte pages that's part cookbook, part culinary history, and part travelogue. There's a ton to read and absorb, and I've only cracked the surface. Quite a few of the recipes call to me, such as Tomatoes with Raspberry Vinegar (perfect for right this moment), Old Dog Shandy (a drink for a football weekend), Brown Butter Balsamic Mushrooms with Hazelnuts and Sage (holiday dinner fare), and Chimichurri (fire up the grill!). I love to try new dishes, but I'm really looking forward to making homemade flavored vinegars. Many years ago I experimented with concocting my own herbal vinegars and found it easy to do and fun to use and give as gifts. Here's a simple recipe from Acid Trip you could make tonight. Cut the apples into quarters and place them in a nonreactive container. In a saucepan over medium-high heat, combine the remaining ingredients and bring to boil. Pour the hot liquid over the apples and place a plate on top of the apples to keep them completely submerged. Cool to room temperature and store covered in the refrigerator for at least 6 weeks before using. In Acid Trip, the vinegar is then boiled down to make a variation on snow candy. If I make the vinegar this month, it will be ready use when the snow starts falling. If you can't wait for snow or live in a warmer local, you can crush ice into a fine powder and use it as substitute. I'm looking forward to sharing more recipes and books and photos with you over the coming year. Welcome to the Abrams Dinner Party! How interesting being involved with the Abrams Dinner ! I can't imagine making my own vinegar and I can't imagine snow this early!! Looking forward to your posts! What a fabulous opportunity for you. I am so looking forward to your reviews. I enjoy making things like vinegar so will try this. I notice it is from a Montreal publisher, I was just there last weekend. woot!!!! this is wonderful ... awesome opportunity and i hope that the computer is there and all set up! Wow, how exciting! That sounds like a fun gig & a great opportunity for someone who enjoys cookbooks as much as you do! Congratulations - enjoy! Yay to the new laptop and to this fun opportunity to review and/or share all those food and drink books. I look forward to seeing your posts and hearing your thoughts. ;-) The vinegar book sounds great--I love trying different flavors and making my own vinegars so I will have to check it out. How cool! I can't wait to see more Abram posts! I've now got this on order from the library. Thanks! You're perfect for this! My mom was just telling me today about the benefits of vinegar. Abrams makes beautiful books - what a treat [double entendre] for you!